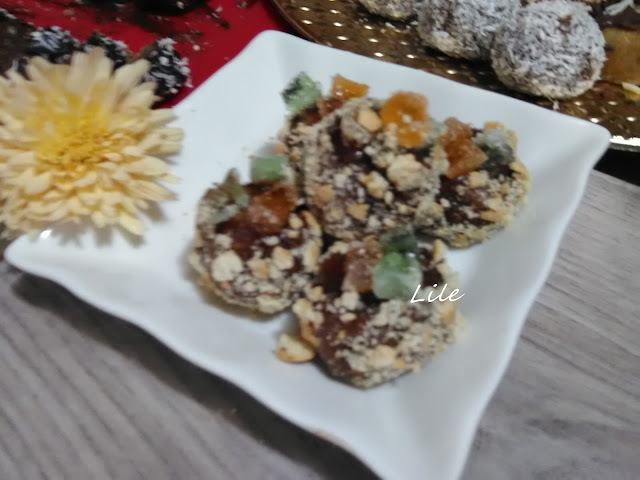 Torti i Kolaci-Sweet and savory kitchen. : USTIPCI SO BANANI.//DONUTS WITH A BANANA. USTIPCI SO BANANI.//DONUTS WITH A BANANA. Ustipci so banani se moj predlog za bezglutenski obrok-breakfast,navistina se vkusni i posebno mirisaat.Meki kako pamuk brzo se pravat. Vo sad za mesenje se mesat site vrsti brasna,se pravi dlabnatina i se stava kvasec.Se doliva topla voda,se stava secer,se stava malku sol. Potoa se zmesuva so lazica testo i se mesa i maslo,i banana. Site sostojki se mesaat zaedno i ostavat pokrieno testo da stase. Posle 45min testo e gotovo za przenje,se stava malku povece maslo vo sad za przenje. Se namasteni race so malku maslo se zema so lazica od testo i malku se istencuva testo. Se pustaat parcinja od testo i se przat na umerena temperatura,dodeka se zacrvat od dvete starni. Gotovi ustipci od banani se vadat na hartiena salfeka da se iscedi visok na masnotija. 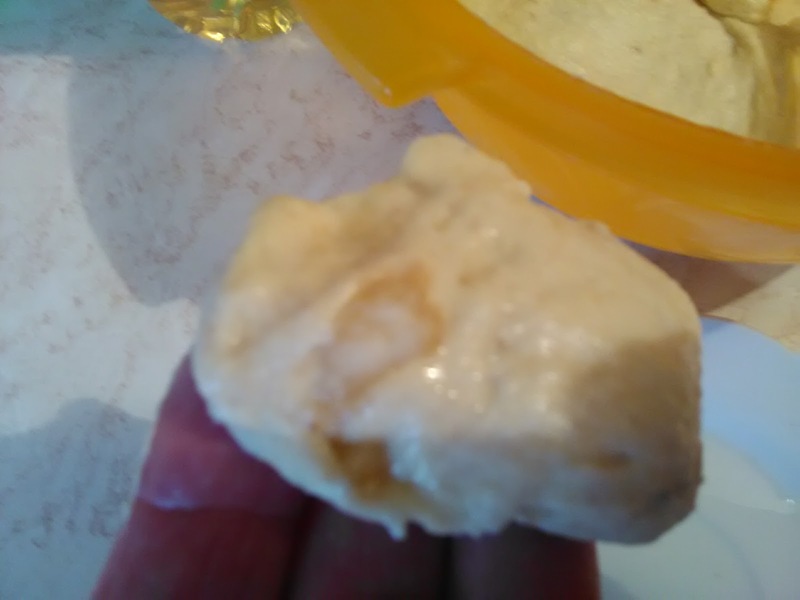 Se posipuvaat so secer vo prav i sluzat kako vkusen detski obrok,i za lica alergicni na gluten,mleko i jajca. Ovaa bese moj eksperiment da probam nesto novo da napravam so banana. I e uspesno,moite ustipci se mnogu vkusni,i so meka struktura,uste i mirisni. 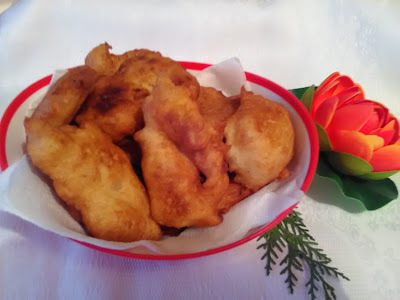 Donuts with a banana, is my proposal for gluten-free, meal-breakfast, very tasty and with a special scent. Mecca after cotton, and quickly and easily are made. 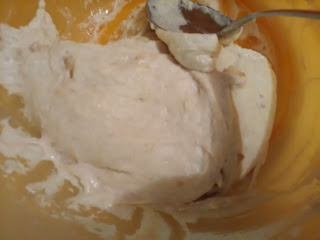 In mixing bowl mixed all three types of flour, make a hollow, put yeast.Add warm water and add sugar and a little salt. Knead the dough, spoon and add more oil and banana. All the ingredients to unite and let rain covered. After 45 minutes, the dough e done, frying, pour to warm a little more oil in the frying pan. With greasy hands on the oil, take the dough with a spoon and arms want. Lower the dough with oil to fry the donuts, at moderate temperature, until golden brown, from both parties. 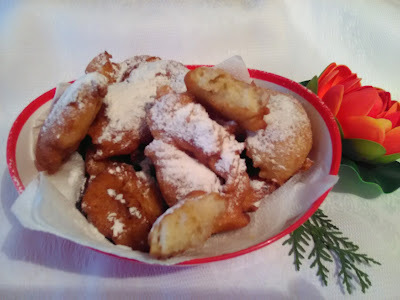 Finished banana fritters remove the paper SALFI to absorb excess fat. Sprinkle fritters with powdered sugar and serve a very delicious baby meal, and for people who are allergic to gluten, eggs and milk. This was my experiment was successful, adding banana, I got a really tasty fragrant and soft, donuts.